Sherpa Tip: Before you can start working with your service center’s schedule, configure your scheduling rules; see the How do I set up my service center’s availability for scheduling? knowledge base article and/or Set the Schedule with Technician Settings Ascend University module for details on this process. A manager may override any availability slots where a user is not available. When a repair is created, it automatically sets the Due Date as the next available date when there is time any technician is free. If the customer doesn’t need the repair for a while, or the service must be performed by a specific technician, the Due Date can be changed. 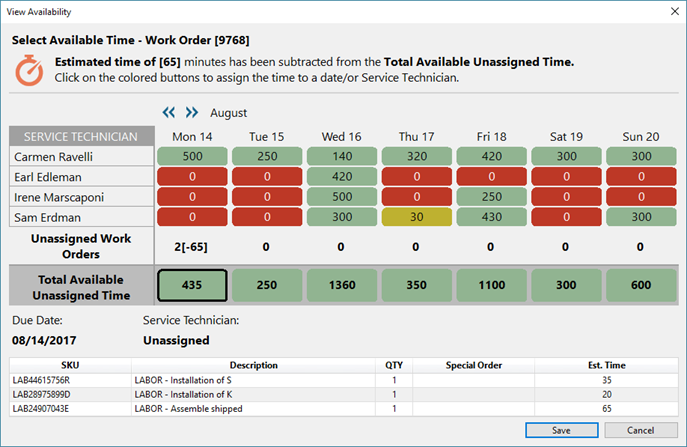 From Work Order Details, click the View Availability button to access the Availability utility. All service technicians display with their available time available. Red: Technician has no available time remaining. Yellow: Technician has available time remaining, but it is less than the amount required for the current repair. Green: Technician has ample time available for the current repair. Click the cell for the technician and date to assign the repair to that technician by that due date. 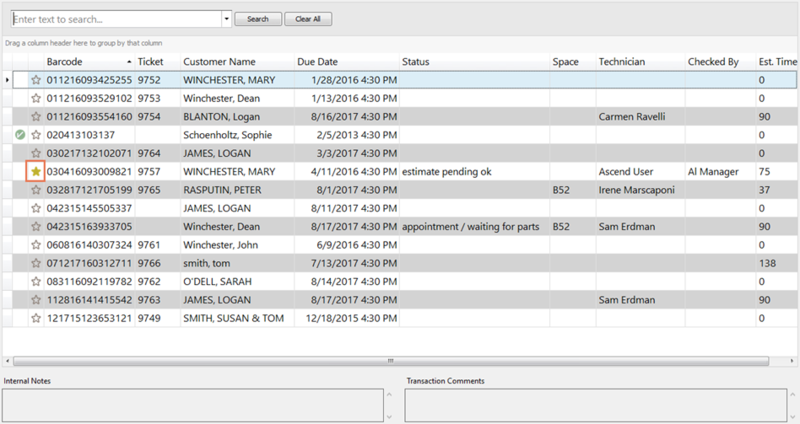 To assign the repair to a due date and allow any technician to claim it, click the cell in the Unassigned Time row. Access the Work Orders Due screen. From the Ascend Desktop, click the WO Due tile. 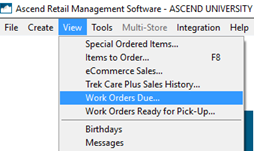 From the Ascend Desktop, select the View menu > Work Orders Due. Columns in the right grid can be moved, removed, filtered, and/or grouped. 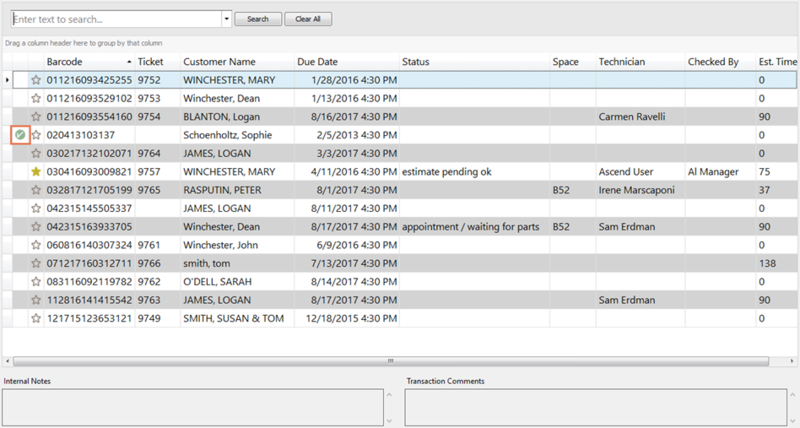 To add additional columns, right-click any item in the header row and choose Column Chooser – then just drag the field to your desired location. Sherpa Tip: User customizations share across all workstations in your store. Special order item status displays next to the repair. Sherpa Tip: If there are multiple special order items in different statuses, the status for the item in the earliest stage of the process displays. To mark repairs which must be completed first as Important, click the star icon next to the repair. In the left pane, apply filters as desired to narrow your selection. Check Limit Due Dates and enter a date range to view those repairs which are due in those dates. Select a Service Technician to view repairs assigned to a specific user. Select a Status to view repairs at a specific state in the process. Select a Space to view repairs with that Space name. Sherpa Tip: Only one repair/serial number combination can share a Space, but multiple Spaces may share the same name. In Special Orders, check the desired special order status(es) to view repairs which have a special order item in that status. Check Assemblies to show all repairs, including items which were marked with Assemble Item. Uncheck to show repairs only. Check Important to view repairs marked to complete first.